Low-carb, high-fat diets are more popular than ever. From celebrities and fitness models to nutritionists, everyone is praising their benefits. The keto diet plan, which was initially designed to treat epilepsy in children, shows promising results in the battle against the bulge. Despite its high fat content, this eating plan promotes weight loss, reduces inflammation and improves overall health. A ketogenic diet is an eating plan that limits carbs and encourages the consumption of fatty foods. Compared to the Atkins diet, the keto meal plan is lower in protein and sugars. Some versions eliminate carbs completely. This dietary pattern has been around since 1921. Back then, it was used to treat pediatric epilepsy. Over the years, researchers have found that it may also aid in weight loss and prevent obesity. When you cut back on carbs, fatty acids and ketones replace glucose as the body's main source of fuel. This metabolic state is called ketosis. The keto diet plan has several variations, such as the standard ketogenic diet, the cyclical keto diet (CKD), the targeted keto diet (TKD) and more. Athletes, for example, prefer the cyclical ketogenic diet, which alternates between low-carb days and carb loading. The high-carb phase typically lasts one or two days. This approach allows your body to replenish its glycogen stores and get the energy needed for intense training. Hundreds of studies and clinical trials confirm the health benefits of ketogenic diets. This eating pattern not only accelerates fat loss but also improves cardiovascular health and glycemic control. According to a 2017 review article featured in the journal Nutrients, the keto diet plan may increase metabolism and reduce insulin levels while suppressing appetite. These factors make it easier to lose weight and keep it off. Researchers also point out that ketogenic diets may protect against diabetes, high cholesterol, obesity and other cardiovascular risk factors. A clinical trial published in the BMJ in 2018 found that subjects who ate keto diet foods had lower ghrelin and leptin levels compared to those on a high-carb diet. These hormones influence your appetite and play a key role in weight management. Ghrelin, for example, sends hunger signals to your brain; its levels decrease after you eat. By suppressing this hormone, the keto diet curbs hunger and helps reduce your daily food intake. This diet plan does a lot more than just help you lose stubborn fat. Due to its low carb content, it improves insulin response, keeps your blood sugar stable and supports metabolic health. As Endocrine Web points out, the keto meal plan may help prevent diabetes and reduce its symptoms. Researchers say that it's an efficient way to manage blood glucose levels and body weight. A 2018 review featured in the journal Frontiers in Cellular Neuroscience confirms the benefits of ketogenic diets in the treatment of drug-resistant epilepsy. Another study, which was published in Oncology Letters in 2015, suggests that this eating pattern may inhibit tumor growth and improve outcomes for cancer patients by starving cancer cells of glucose, their primary source of fuel. The keto diet appears to be effective in the prevention and treatment of neurological disorders. It's particularly beneficial for people with Alzheimer's disease, Parkinson's and epilepsy. This dietary plan may prevent motor function loss, protect against brain damage and reduce the occurrence of seizures. Now that you know how this diet works, you may wonder what to eat. Ideally, your meals should be low in carbs, high in fat and moderate in protein. Meat, poultry, eggs, coconut oil, olive oil, MCT oil, butter, avocados, Brazil nuts and fatty fish are among the best keto diet foods. According to the Harvard T.H. Chan School of Public Health, this dietary plan is 5 to 10 percent carbs, 10 to 20 percent protein and 70 to 80 percent fat. Most versions limit carbs to 50 grams per day. Some dieters, though, can eat up to 100 grams of carbs daily without being thrown out of ketosis. Tuna, salmon, sardines, mackerel, haddock and herring are all rich in protein and omega-3s. As the American Heart Association notes, omega-3 essential fats promote cardiovascular health and improve blood lipids. These nutrients also prevent plaque buildup in the arteries, leading to a lower risk of heart disease. Nutritionists recommend eating at least two servings of fish per week. To stay on the safe side, avoid or limit high-mercury species. King mackerel, bluefish, bigeye tuna, swordfish, shark and halibut are just a few examples. Fill up on butterfish, monkfish, crab, herring, oysters, shrimps and cod. Rich in saturated fat and medium-chain triglycerides (MCTs), coconut oil makes it easier to enter ketosis and stick to your diet. According to a 2015 review article published in PLOS ONE, saturated fats may not increase the risk of heart disease as once thought. On the contrary, they may help prevent and reverse metabolic syndrome, reduce inflammation and aid in weight management, leading to a lower risk of cardiovascular problems. When you're on a low-carb diet, your body can use the fatty acids in coconut oil for fuel. As a result, you'll experience increased energy and mental focus. Due to its high content of MCTs, this popular food can accelerate weight loss. A 2015 meta-analysis published in the Journal of the Academy of Nutrition and Dietetics shows that medium-chain triglycerides may reduce body weight, hip and waist circumference, total body fat and abdominal fat without affecting blood lipids. Coconut oil has also been found to protect against liver damage and improve arthritis symptoms due to its anti-inflammatory and antioxidant effects. Whole eggs are among the healthiest and most nutritious keto diet foods. The yolk is loaded with protein and B vitamins. A large egg has less than 1 gram of carbs and provides 71.1 calories, 6.3 grams of protein and 5 grams of fat. It's also rich in vitamin A, vitamin B12, riboflavin, selenium, phosphorus, iron and calcium. When you're on the keto diet, you can prepare your food however you want. Eggs can be fried, boiled, scrambled, baked, poached and so on. There are no restrictions. You can even have mayo on keto since it's made with eggs and oil; just make sure you prepare it at home — commercial varieties often contain hidden sugars and artificial sweeteners. 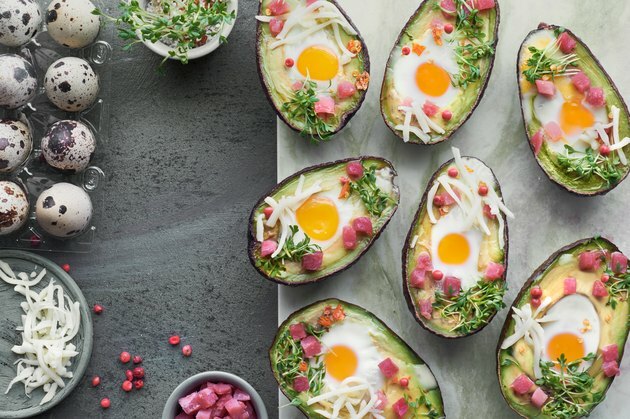 Rich in healthy fats, avocado fits perfectly into the keto meal plan. One fruit boasts 14.7 grams of fat, 2 grams of protein, 6.7 grams of fiber, 8.5 grams of carbs and 161 calories. Compared to most fruits, it's lower in sugar and carbs. A 2015 clinical trial published in the Journal of the American Heart Association found that obese and overweight subjects who ate this fruit as part of a moderate-fat diet had lower cholesterol levels than those who didn't eat avocados. Scientists attribute these benefits to its high levels of MUFAs (monounsaturated fatty acids). This fruit also keeps your digestive system running smoothly and may prevent constipation due to its high fiber content. Constipation is a common complaint among dieters. Meat, fish, eggs and other low-carb foods contain little or no fiber. Eating avocados is a simple, effective way to stay regular and avoid bloating. This beloved treat isn't necessarily high in carbs, but it's easy to go overboard when you have a whole jar in front of you. If you eat 6 tablespoons over the course of a day, you'll get 19.2 grams of carbs, including 9 grams of sugars — plus the carbs from other foods. For some dieters, that's enough to kick them out of ketosis. Remember, moderation is the key. Ideally, make your own peanut butter or choose an all-natural brand. Many varieties available in stores are high in sugar, sodium and refined oil. Make sure the label says 100 percent natural or without added sugar. Most weight-loss plans require dieters to choose leaner cuts of meat, remove the skin from poultry and trim all visible fat. The good news is that you don't have to do these things while you're on the keto diet. On the contrary, you can enjoy bacon and other fatty meats, snack on pork belly and eat steak at every meal. Lamb chops, baby back ribs, chicken thighs and game meats are all allowed. Grass-fed meat and poultry have zero carbs. However, this doesn't apply to sausages, hot dogs and deli meats, which may contain hidden sugars and starches. When eating out, stick to grilled, steamed or roasted meat with no sauce. Grilled chicken breast, scrambled eggs with bacon, roast beef, bunless burgers, smoked chicken and tandoori chicken are served in most restaurants and fit into the keto meal plan. Serve meat with leafy greens, broccoli, cauliflower, cabbage, bok choy, asparagus and other low-carb vegetables. Sugar-free pickles and sauerkraut are a good choice too. Steer clear of rice, potatoes, bread, croutons, carrots, pasta and noodles. These foods are off-limits on the keto diet because of their high carb content. Just being on the ketogenic diet doesn't mean you must give up cookies, waffles and pancakes. In fact, you can even eat bread. There's a catch, though. You need to prepare these foods at home and swap grain flour for almond, coconut or konjac flour and sugar for stevia. One cup of almond flour, for example, has 24 grams of carbs, including 14 grams of fiber and 4.9 grams of sugar. It also provides 56 grams of fat, 24 grams of protein and 648 calories. The same amount of white flour, by comparison, delivers 95 grams of carbs, 13 grams of protein. 1.2 grams of fat, 3.4 grams of fiber and 455 calories. Another option is to use flax meal (ground flax seeds). It's an excellent source of omega-3s, fiber, protein and antioxidants. One cup has 888 calories, 70.8 grams of fat, 30.7 grams of protein and 48.5 grams of carbs, including 45.9 grams of fiber. Mix flax meal and almond or coconut flour to make cookie dough, bread, low-carb muffins and other keto-friendly goodies. Endocrine Web: Ketogenic Diet: Is It Good for Diabetes and Weight Loss?